Complete design and production of bilingual rack graphics for the Premium Plus Ultra display found in Home Depot stores. The leaf cluster icon which showcases the take-home paint chips remains consistent throughout the paint line's brochures and packaging. Complete design of headers, brochures and directional signage for the Behr Color Solutions customer experience center in Home Depot stores. All pieces designed for English/ Spanish bilingual use. Rack graphics and brochures for Premium Plus exterior paint and stain display. Palette dividers show color use as well as transparency of stain. Rack graphics and complete brochure system designed for Behr in 2002. Basic rack design remained in Home Depot stores through 2014 with brochures and header receiving updates periodically. Traditional and elegant cabinet concept for Marquee customer experience. Display furniture painted black for aisle impact and color display. Header sits back inside the hood with a spotlight on message which echoes the can label design. Static convex chips create a visual palette while pockets underneath store take-home paint chips. Modern and sophisticated with beautiful rich colors, this Marquee Rack concept is luxurious yet still fun with easy-to-use-organization. A back-lit center message panel may be static or loop images for maximum customer inspiration. Nature and simplicity are the inspiration for a Marquee rack concept. The hexagon form of the honeycomb is original and memorable. Unlike square chips which only have four neighbors, each hexagon chip can have up to six colors adjacent. 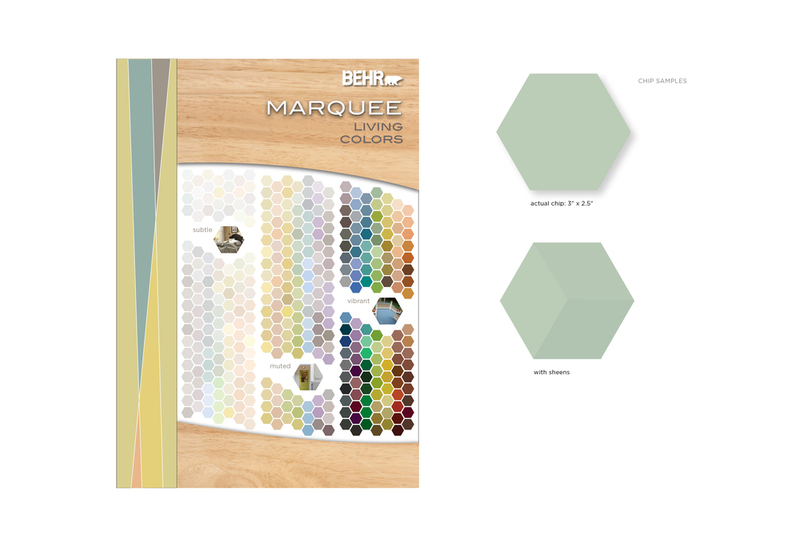 Fitted together, the hexagons convey visually, that all these colors work together. Simple upper graphics with lively core palette graphics and brochures designed for Premium Plus and Premium Plus Ultra to catch the attention of the Home Depot customer. Concept rack graphics, color brochures and mini-inspiration cards designed for the Behr Premium Plus customer experience. The Home Decorators Collection paint display, currently found in Home Depot stores segments colors into five distinct styles: Neutral, Cottage, Arts & Crafts, Classic and Modern. Initial concepts for the Home Decorators Collection color display for the Home Depot. Each concept uniquely organizes the five color collections and brochures.